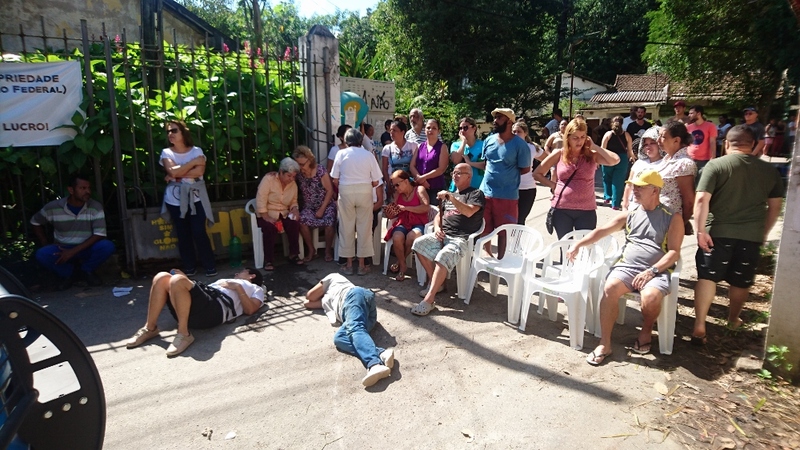 On November 7, the Military Police arrived at the Horto community in the Jardim Botânico neighborhood in the South Zone of Rio de Janeiro at around 6am to evict Marcelo de Souza and his family, one of a handful of families so far who have received eviction notices. Military Police vehicles gathered outside the entrance of Horto, blocking a lane of traffic down Rua Pacheco Leão. Community residents welcomed outside support, including reporters and notable local figures like Miguel Baldez, professor and president of the Institute of Critical Legal Study; José Martins de Oliveira, community organizer and founder of Rocinha Sem Fronteiras; and Renato Cinco, a city council member. Residents found out just last Friday, November 4, that the the first removal was planned for Monday, November 7. On Saturday, they found out it would be Souza’s house. The Horto Neighborhood and Friends’ Association (AMAHOR) called a meeting on Friday with residents to plan a resistance strategy. As part of their plan, residents were on watch at the entrance to Horto from 2am Monday morning, and were there when the Military Police arrived. Military Police blocked road access to Marcel’s house from either direction in the morning. Only people with authorization, generally attorneys and government officials, were allowed to pass, and families were left divided by the lines of armed police. Community leaders remained behind the Military Police lines attempting to facilitate communication with residents, attorneys, representatives, and police. Once residents left the blocked area, they were not allowed back in. Souza’s family remained in their home, and Souza came out temporarily in the morning to share his story. Around midday, Military Police took up watch along foot paths through forested parts of Horto. Shock Troops stood at the end of the road, near the entrance to Horto, and began approaching Souza’s home. They fired shots in the air, and residents grew nervous. Military Police in the first line encouraged residents to pass so they wouldn’t be left in front of the Shock Troops, but many remained in front of Souza’s home between the two lines of Military Police. When Shock Troops were close, they threw tear gas bombs into the crowd, which included teens and elderly residents. Residents fled past the second line of Military Police and rushed to help those left most affected by the gas. Military Police lines maintained position and began refusing reentry, even to some, like Simone Amara, an Horto resident and attorney, who had been inside the blockade trying to facilitate the discussion. In the early afternoon, Shock Troops turned their attention to Souza’s home. They threw tear gas into the home and used pepper spray and rubber bullets to force those inside to evacuate. Once the house was empty, Military Police removed Souza and his family’s possessions from inside and loaded them into a moving truck. 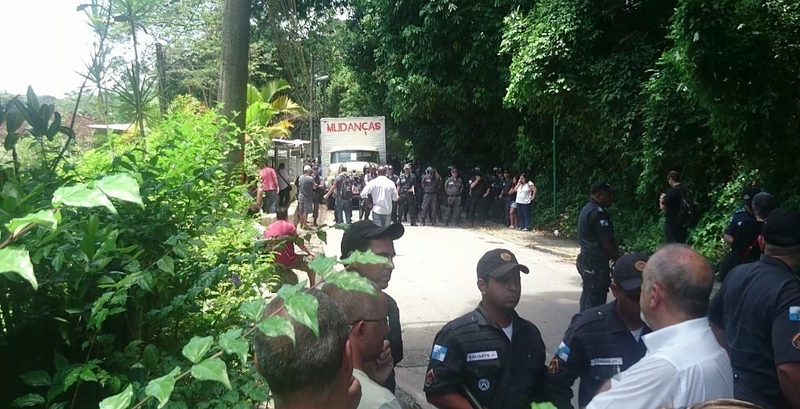 Residents then descended down Rua Pacheco Leão, which runs along one side of the Botanical Gardens and to the entrance of Horto, to protest evictions. 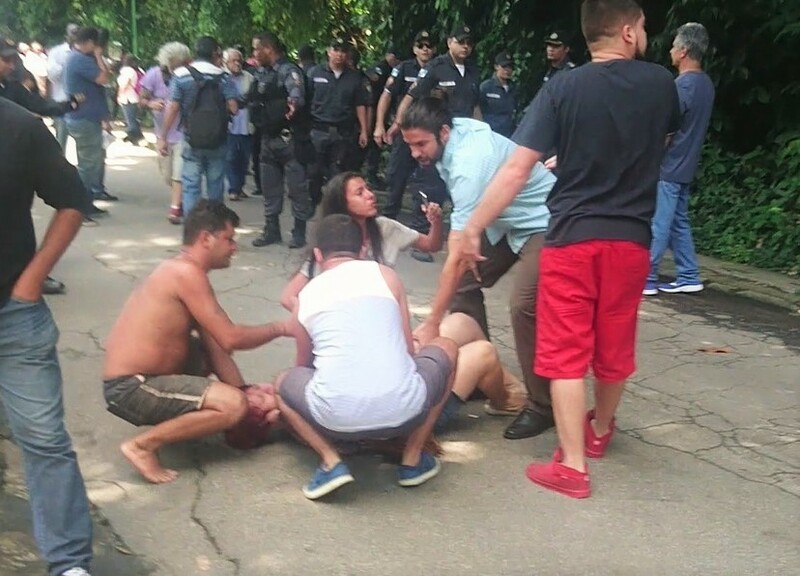 Residents occupied Rua Jardim Botânico, blocking traffic and forcing it to be diverted through Lagoa. 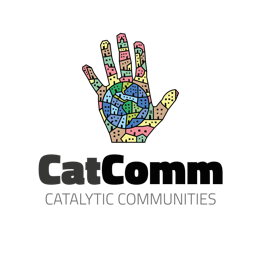 When residents attempted to move the protest to Lagoa, Military Police again responded with tear gas, forcing residents to flee back to Horto. The demolition of Souza’s home began later in the afternoon. His belongings were left on the street, and he and his family were left without anywhere to stay. Souza and his family have been offered no alternative housing or monetary compensation despite the right to dignified housing guaranteed in Brazil’s constitution. The Botanical Gardens has cited environmental reasons for removing Horto and alleges that it will use the area to increase its research capacity. 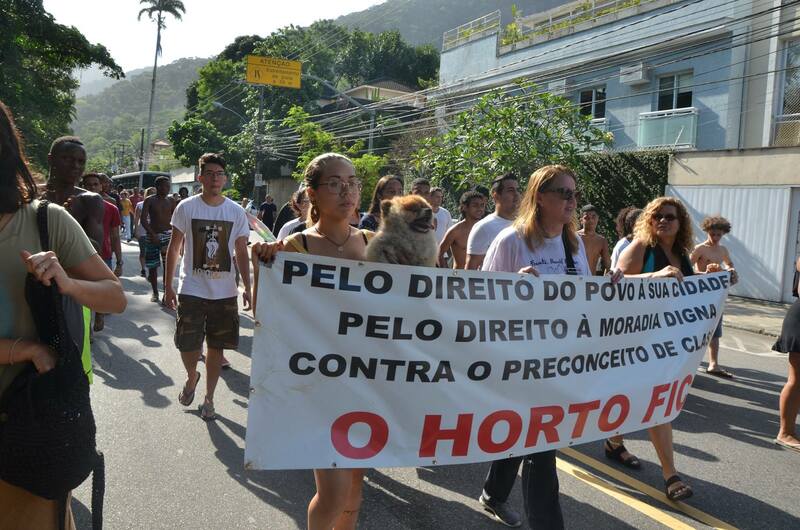 According to Globo, the news giant who has headquarters in the area, the land value of Horto is some R$10.6 billion. This most recent effort by the federal government to remove Horto began after Interim President Michel Temer took office. Under Dilma Rousseff’s administration, Horto and the government had agreed to a land regularization plan that would have allowed residents to remain and normalized their legal rights to their homes. Temer’s Minister of the Environment, Sarney Filho, appointed in May, instead gave authority to decide what would happen to Horto to the current head of the Botanical Gardens, Sérgio Besserman. In a meeting with community leaders from Horto last month, Besserman, unyielding, told residents he would enforce the August order by the Court of Accounts giving the Botanical Gardens 90 days to begin removing Horto. 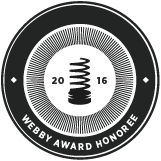 This article was written by Laura Bachmann, and published on November 9, 2016.